This week, Brunei made waves across Southeast Asia when Sultan Hassanal Bolkiah announced that he would move his nation towards implementing Islamic Sharia law into its national penal code. The Sultan has ruled Brunei since 1967 and possesses absolute executive authority as head of state. While Sharia had previously existed in Brunei in the form of an Islamic court, its role was mainly restricted to dealing with family law and disputes. Notably, the new penal code will only be applicable to Muslims–about two-thirds of Brunei’s 420,000 residents. Under the new penal code, violators will be subject to brutal capital punishment including having their limbs severed for theft and stoning for adulterers. The move has already come under criticism from Western human rights groups. Phil Robertson, deputy Asia director at Human Rights Watch, said that "Brunei is showing its feudal characteristics as an 18th-century state rather than an important member of a regional Southeast Asian economic and social consensus in the 21st century.” Brunei will become the first and only eastern Asian country to implement such strict Sharia law at the national level. Brunei’s neighbors, Malaysia and Indonesia, implement Sharia law to a lesser degree, using it to regulate personal matters like custody rights and marriage–similar to Brunei’s previous stance. Malaysia’s Terengannu province, and Indonesia’s Aceh province have however implemented Sharia in full. Still, there are concerns among some that this decision might negatively impact the tourist industry in Brunei. 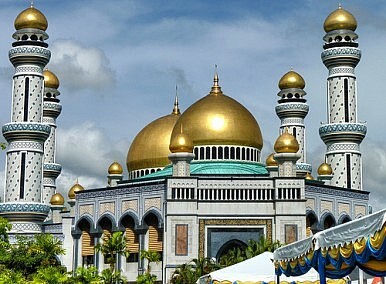 Despite the Sultan’s efforts to strengthen the role of Islam in Bruneian life, some commentators have suggested that such strict Sharia law may be in conflict with Malay culture, and Brunei’s peaceful nature. Brunei, officially known as the Nation of Brunei, the Abode of Peace, might find itself hard-pressed to retain that moniker with its foray into such a draconian legal system. Ankit Panda is Associate Editor of The Diplomat. You can follow him on Twitter @nktpnd.